Here are some photos of Adventure Team G.I. Joes from my collection as well as links to other pages and information on them. 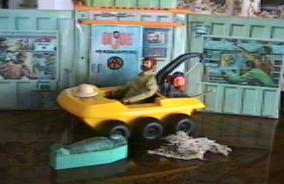 Make sure you visit my other sites for more toys, including Big Jim and Six Million Dollar Man! Search for the Stolen Idol This set includes the Yellow Helicopter, a cobra snake, and the idol. It also includes three jewels that store in a secret compartment of the idol. 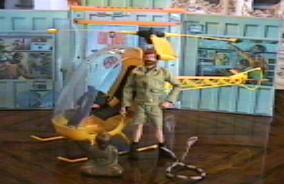 A botton on the side of the helicopter caused the rotors to spin, and a winch on the bottom helped joe carry the idol. Posing is the Sea Adventurer. Sea Wolf This is the white one man submarine of the Adventure Team series. 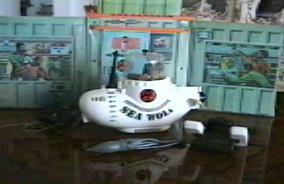 It features a hand air pump to control the ascent and descent of the submarine, and a viewer to see the submarine underwater (viewer is at the right of the sub, pump at left, not clearly shown, sorry). 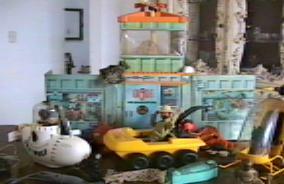 It also included a giant squid so joe could entertain himself catching it, scuba mask and hose are inside the sub. Piloting the sub is Mike Powers, the Atomic Man! Secret of the Mummy's Tomb One man All Terrain Vehicle (ATV), with a winch on the back. This vehicle could actually float on water. This set includes a mummy and case, three jewels, pick, shovel, net. It also included the clothes on the figure, khaki shirt and pants, boots, and helmet. LINKS! The GI Joe Adventure Team The page to visit if you are a AT collector. Just great! For comments or suggestions, or just to contact a fellow collector mail Topace AT GI Joe page visited times.